Lucienne Cross is a freelance writer and project manager focusing on climate resilience, environmental justice and green infrastructure. 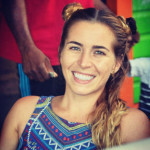 She has worked primarily in the Caribbean, covering community- and market- based conservation projects for The Nature Conservancy and writing proposals for small-scale, farmer-led sustainable business projects in the cocoa sector. Lucienne has a Master’s in Public Health as well as a Bachelor’s degree in Global Disparities, both from the University of Michigan. She is a certified LEED Green Associate and holds a certificate in Permaculture Design and Watershed Management. Indonesia builds a resilient "living shoreline"
Climate twins: which city will your city feel like in 2080? Can the Cayman Islands save the Caribbean's remaining coral reefs? Is the Green New Deal the all-inclusive climate plan we need?